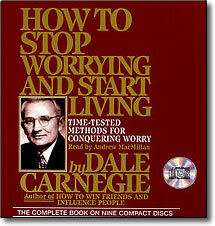 How to Stop Worrying and Start Living – Audio by Dale Carnegie – Save! habit — now and forever! With Dale Carnegie’s timeless advice in hand, more than seven million people have learned how to eliminate debilitating fear and worry from their lives and to embrace a worry-free future. In this classic work, How to Stop Worrying and Start Living, Carnegie offers a set of practical formulas that you can put to work today. It is a book packed with lessons that will last a lifetime and make that lifetime happier! This bestselling program has been recently revised to help more people overcome the worry habit–today. Practical formulas you can put to work immediately — formulas that will last a lifetime! How much are these books, I want to have them.